Could AT&T kill the iPhone Brand? According to a study conducted by Gartner, the first quarter of 2010 witnessed a whopping 707 percent increase in Android sales. 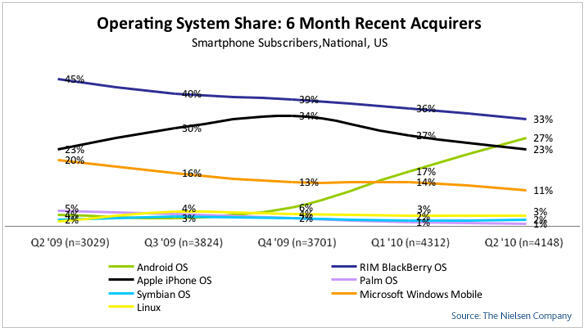 As a result, the sales of the Google Android OS-based smartphones have surpassed the sales of the Microsoft Windows Mobile-based handsets around the world. And this month I saw a stat that said the sales of Google Android phones in the U.S. are rising so quickly, that they have outsold Apple handsets for the first time on record and it got me thinking. Could Apple’s decision to sell exclusively through AT&T be the very decision that kills there brand? But as 4 time owner of the Apple iPhone I still don’t see a reason to switch. Yes I have seen the iPhone4 vs HTC Evo video (hat tip to my life long buddy Steve Schnoll at SuccessFactors for making me watch it!) which cost a Best Buy employee his job for posting it. But I don’t care either. My advice to Google and the brand group at Android is this – stop advertising the phone and start creating exclusive apps that only are available on the Android platform. Ok I know they already have exclusive apps on the Android platform but I meant ones that I would care about. Call this the Howard Stern theory like when he moved exclusively to Sirius Satellite Radio. Why didn’t FIFA World Cup have an exclusive app that was only available on Andriod – that would get people to start switching to their platform! AT&T has seen a 50 fold increase in the amount of data flowing over their network but I still don’t feel confident that they can keep up. As a brand manager I would feel constrained by the AT&T brand and be lobbing internally at Apple to set the iPhone free before it’s too late. 14 comments to Could AT&T kill the iPhone Brand? I agree the end of exclusivity will hurt AT&T more than Apple – in my opinion they cant end it soon enough. Apple has done everything in its power to turn me away but for coming to my house and physically reclaiming all the expensive equipment. They have washed their hands of the AT&T debacle and insisted the problem (no service, two years) is mine and not theirs. AT&T insists that they cannot give service to iPhone and want me to switch phones or hack it. Great. I am SO over the “mystique” or cache or whatever of Apple. Their utter failure to enforce any sort of quality standards in their contract with AT&T on behalf of their own consumers shows us exactly how little they value us beyond our initial investment. You’ve drunk the Koolaid and bought all our expensive gear. So what if your phone only works for apps, isn’t it pretty and cool? F* that. thank you for commenting Jacqueline! That HTC video was hilarious. Love my iPhone for everything else but the phone. Hate the lousy handshake the hardware has with AT&T cell towers. Hate the fact that when I replaced my phone, I had to search online message boards to figure out how to re-set up my voicemail. (store said it would happen automatically when i synced, at&t gave me a new p/w said it would work). Yes, as a consumer, makes me think twice about both brands. @Sharon – thanks my kids love that video too – they quote it every day now. Paul, I think that the communications industry needs to find a stronger, alternative business model that is not based on smartphone differentiation and monthlly calling plans. That’s for now the only “game plan”. I’ve written on the topic and my take is that this leaves network operators at the mercy of fluctuations of device cycles. You are into something when you say that apps are key. Network operators would need to look into better and more targetted content and services if they are going to move from dumb pipes to smart pipes and avoid depending on the Apples, Googles, Samsungs of the world. The opportunity is bigger than whether they have the iPhone or not, but the window of opportunity is closing. @Monica – totally agree and that’s a great point about differentiation based on the device – you can clearly see that in the HTC Evo vs Iphone 4 video I linked to. The “pull” of the Apple brand is based solely on the device and perhaps the experience on the device as well. And as you say this is just not enough or sustainable for the long term. Great comment! Say, it ain’t so !!! You may be right on the money. We wished from the outset that Apple would have made a deal with Verizon instead. Now, it appears that door has closed with the introduction of the Droid. Jacqueline Church – brilliant! Now if only I could give it all up. Jeff Hasen – I agree, but not on the foot traffic issue. There’s a mall down the way that has an apple store across from an AT&T store and Apple’s slammed.